Noun. Obsolete except Historical. Mid-16th century. It's hard to imagine that executioners have historically been drawn from the best and brightest, but if I were to ever face one, I'd at the very least want him to be good at his job. 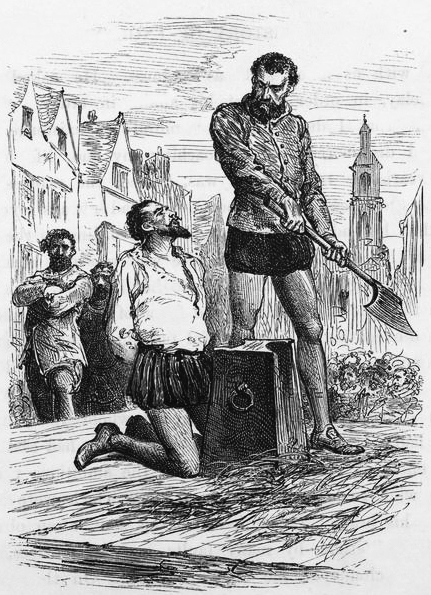 Stories of condemned men tipping their executioners are not without reason - it took the ham-fisted carnifex of Margaret Pole, Countess of Salisbury, approximately ten attempts with his axe before he finally managed to dispatch the poor lady. The word carnifex is derived from the Latin caro (flesh) and facere (to make), and was also used to refer to a butcher. While a butcher might seem an appropriate comparison to Pole's carnifex, the fact is that butchers tend to be fairly handy with blades, and specifically a blade's application to flesh. Evidently Pole's carnifex, described as "a wretched and blundering youth," was not. Do please swiftly dispatch your comments below. Oh! I do wish I'd not read that snippet about Margaret Pole! Me tummy's not happy now! Historians believe he had the axe upside down. I heard he used a potato masher.